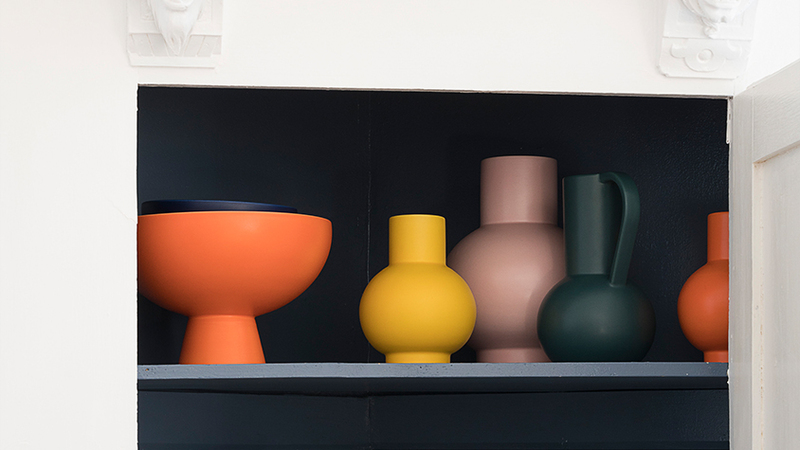 Drawing inspiration from still lifes by Danish modernist artist Vilhelm Lundstrøm this sculptural ceramic vase—handmade in Portugal using a slip-cast technique—marries refined simplicity with everyday function, picking up on the color palette and minimal yet mindful proportions of the simplified bowl, vessels and vases that characterize Lundstrøm's work. Designed by Nicholas Wiig Hansen, the Raawii Strøm Collection is distinguished by Hansen’s signature focus on shape being informed by function. This vase is ideal for medium-sized flower arrangements. Choose from a vivid color palette of vibrant orange, coral blush, green gables, yellow, vaporous gray and blue. The large orange vase is a MoMA Exclusive. Raawii was founded in Copenhagen in 2017 and are known for their collections of homewares distinguished by geometric shapes and striking colors. The pieces are designed by Nicholai Wiig Hansen, who has had his own design studio since he was 26 years old. Proportions are an important aspect of Hansen’s ceramic designs for the Raawii Strøm collection and he is inspired by the things that surround him: art, food, nature and machinery.